History: (X-Men: The Animated Series cartoon - "Beyond Good and Evil, Part 3" - BTS) - The eternal mutant Apocalypse chose four powerful mutants to serve as his personal strikeforce. Naming them his Horsemen after the biblical foursome, Apocalypse most likely used alien technology to enhance the group's powers to better suit their new names: War, Famine, Pestilence and Death. 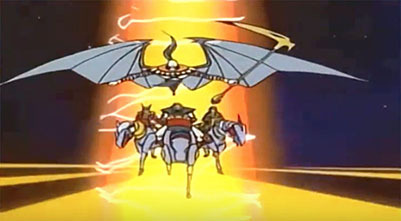 He also provided three of his Horsemen with flying mechanical horses. (X-Men: The Animated Series cartoon - "Beyond Good and Evil, Part 3" (fb) - BTS) - The Horsemen acted as guardians of Apocalypse's Lazarus chamber, which allowed the eternal mutant to regenerate through the ages. 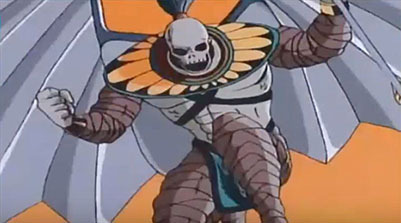 (X-Men: The Animated Series cartoon - "Beyond Good and Evil, Part 3" - BTS) - In 1200 BC, the Horsemen were contacted by a future version of their leader (hailing from Earth-13393, CA 3999, Cable's future). This Apocalypse had obtained access to the Axis of Time and prepared to kidnap the world's most powerful psychics in order to stop time and break the elemental balance between good and evil that always prevented him from achieving final victory. Realizing the X-Men would come looking for him at the Lazarus chamber, Apocalypse ordered his past Horsemen to help set a trap. 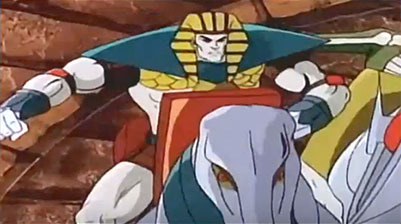 (X-Men: The Animated Series cartoon - "Beyond Good and Evil, Part 3") - As expected, Cable and the X-Men traveled to 1200 BC in search of the Lazarus chamber. When Beast opened the pyramid's entrance, the Horsemen were ready for them. The Horsemen successfully split up the X-Men by allowing Cable, Professor X, Wolverine and Beast to "escape" into the pyramid while they fought Archangel, Cyclops, Gambit and Storm. With their opponents divided, the Horsemen quickly retreated into the pyramid to continue their battle. War was lured into one of the Horsemen's own traps by Cable, who had expert knowledge of the pyramid. Wolverine fought Death and even destroyed his scythe. Beast faced Pestilence and knocked her off her mechanical horse after which Famine suddenly appeared, ready to trample Beast. He was rescued by Gambit, who used his supercharged cards to distract the Horseman while the other X-Men caught up with them. Seemingly unwilling to fight on, Death, Famine and Pestilence escaped into narrow corridors. This allowed the X-Men to enter Apocalypse's Lazarus chamber, unaware they were walking straight into the final trap. When the fabled Lazarus machine opened, it wasn't Apocalypse who stepped out, but Mystique. With his opponents distracted, Apocalypse activated his weapon and with a bright flash, the X-Men were rendered unconscious. With no one left to oppose him, Apocalypse claimed his final telepath, Professor X. (X-Men: The Animated Series cartoon - "Beyond Good and Evil, Part 4" - BTS) - The Horsemen followed Apocalypse to the Axis of Time. 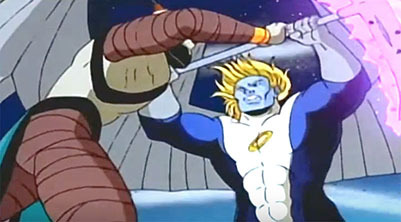 (X-Men: The Animated Series cartoon - "Beyond Good and Evil, Part 4" - BTS) - Suspecting there was more to Apocalypse' plans that he'd been led to believe, Magneto confronted En Sabah Nur and forced him to reveal his true intent: the simultaneous deaths of all the gathered psychics would actually unleash sufficient psychic energy to break the balance between good and evil. However, as an added consequence, all of existence would end except for the actuality inside the Axis of Time, allowing Apocalypse to recreate the universe in his own image. Magneto was shocked and decided the time had come to step in. Apocalypse immediately ordered his Horseman Death to strike him down but failed to realize Mystique had taken the shape of Death and plunged the Horseman's trademark scythe deep into Apocalypse' own back. Now joining forces against the eternal mutant, Magneto and Mystique successfully forced Apocalypse to fall from the castle's wall. 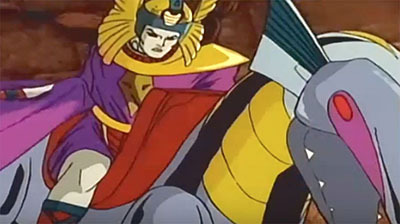 (X-Men: The Animated Series cartoon - "Beyond Good and Evil, Part 4") - Apocalypse' Horsemen suddenly reappeared, flying through the castle's wall to rescue their master. The Horsemen then fought alongside Mister Sinister and his Nasty Boys against Magneto and Mystique although they managed to free Wolverine, convincing the X-Man to help them. Tired of facing his adversaries, Apocalypse ordered Pestilence and Famine to place a special orb into the center of the Axis of Time which would start the event and activate the psychics. The psychics, while stuck in individual canisters, were forced to float, circling the Axis of Time. Apocalypse and the Horsemen, however, were unaware X-Men associate Bishop had found himself witnessing all this while stuck outside of time on the threshold of the Axis of Time. He decided to get involved and shot one of the canisters, freeing Psylocke, who immediately ordered the time-lost Bishop to continue shooting at the remaining canisters. When several other psychics were released, Apocalypse knew he was in danger of failing. He sent his Horsemen to kill Bishop and Psylocke, but they failed. When they returned to the Axis of Time, the strain of the events caused the structure to collapse. Apocalypse and his Horsemen fought Magneto, Wolverine and Cable until the freed psychics joined their powers to stop Apocalypse. With their combined powers, the psychics removed Apocalypse and all others from the Axis of Time. Since his Lazarus chamber had been destroyed in the past, Apocalypse simply ceased to exist in the present. Although unrevealed, it's possible the psychics returned the Horsemen to their proper timeline. Comments: Created by Michael Edens (writer), Frank Brunner (character design) and Mark Lewis (character design, prop design, storyboard cleanup) (see Appearances list for a full list of artists). 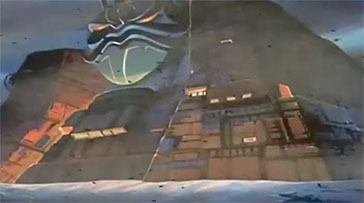 "Beyond Good and Evil" was intended to be the series finale and was originally going to end with the X-Men disbanding after the final conflict with Apocalypse. However, the series was given a last minute reprive by Fox when they ordered six more episodes to close out the season. To cut costs, Korean animation giant Saban produced these in-house rather than buy a few more episodes at the last minute. As such, the final six episodes have a different animation style. To save money, Saban produced the final episodes of the series in-house rather than calling on Graz Entertainment which had done all of the series. Instead, Saban hired a studio in the Philippines (simply called the Philippine Animation Studio, which also worked on the second season of the 1994 Fantastic Four series) which explains why these episodes had a different animation style. The psychics captured by Apocalypse were: Gamesmaster, Gremlin, Jean Grey, Karma, Mastermind, Mesmero, Moondragon, Oracle, Professor X, Psylocke, Revanche, Shadow King, Stryfe, Rachel Summers, Typhoid Mary and the White Queen. 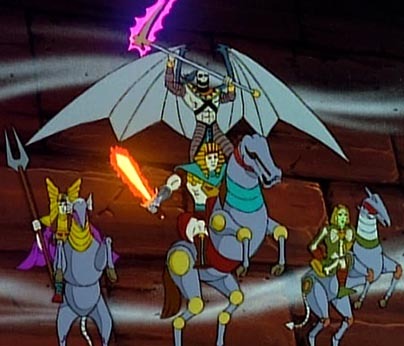 Another incarnation of Apocalypse' Horsemen of the Apocalypse appeared in X-Men: The Animated Series S01E10 - "Come the Apocalypse," consisting of the classic team: Death (Warren Worthington III), Famine (Autumn Rolfson), Pestilence (Plague), War (Abraham Kieros). or any other iteration of En Sabah Nur's "Horsemen of Apocalypse"
Death was a mutant who possessed a pair of large metal wings which he used to fly. He also wielded a powerful scythe that could fire purple blasts of energy. He wore a costume which stylistically resembled Apocalypse' Egyptian origins. --X-Men: The Animated Series cartoon - "Beyond Good and Evil, Part 3," "Beyond Good and Evil, Part 4"
Famine was a mutant who presumably had the ability to induce extreme hunger in living being and animals. She was unusually thin and wore a costume to make it appear as if she was a skeleton. While serving Apocalypse she used a robot horse that could travel on land or fly through the air. Pestilence was a mutant who presumably had the ability to produce and spread bio-hazardous agents from her body. She also wielded a spear that could fire yellow blasts of energy. She wore a costume which style resembled Apocalypse' Egyptian origins. 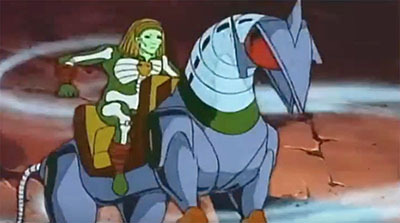 While serving Apocalypse she used a robot horse that could travel on land or fly through the air. War was a mutant who presumably had superhuman strength. He also wielded a sword that could fire red blasts of energy. He wore a costume which style resembled Apocalypse' Egyptian origins. While serving Apocalypse he used a robot horse that could travel on land or fly through the air.